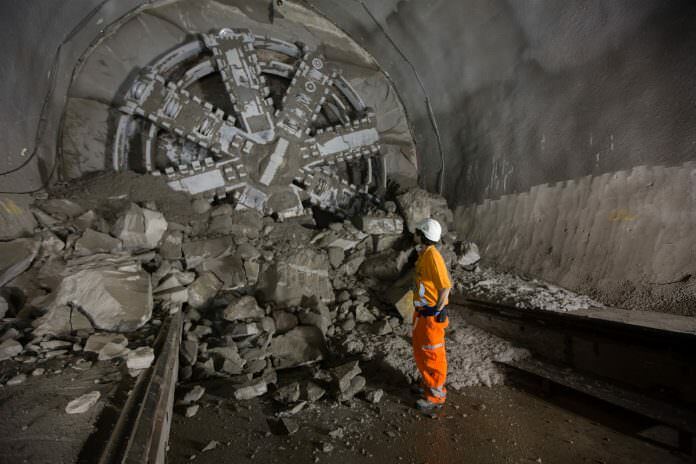 TBM Victoria breaks through into Liverpool Street station in 2015. Credit: Crossrail. The UK’s rail minister has told parliament that Crossrail is almost 85 per cent complete. In a written statement, Paul Maynard – who recently saw HS2 added to his portfolio – said that all central tunnel section platforms have been complete, that the installation of track is more than 90 per cent complete and power and ventilation has reached 70 per cent and 30 per cent, respectively. The Crossrail board has forecast that construction will fall within the £14.8 billion budget but financial pressures are mounting, he added. Paul Maynard said: “Cost pressures are increasing across the project and Crossrail Ltd is identifying and implementing initiatives to deliver cost efficiencies until completion in 2019. The annual update revealed that the installation of platform edge screen doors at Bond Street and London Paddington is underway, as is the fitting of escalators and lifts across the central stations. Digital signalling that was installed in the Heathrow tunnels in April is now being tested too. Drivers are currently familiarising themselves with the trains and new route and staff training is underway. In addition, Paul said that Crossrail’s purpose built training facility, the Tunnelling and Underground Construction Academy, has now become part of Transport for London. The project update comes a week after the first Class 345 train entered passenger service on the Elizabeth line between Shenfield and Liverpool Street, the first of five stages to Crossrail’s opening strategy. Trains were due to enter service in May but Paul Maynard told parliament that testing, assurance and approvals took longer than anticipated. Nearly there. Edging closer to completion. Plus the new Class 345’s are already operating between Shenfield and London Liverpool Street (TfL Rail) with more Class 345’s to be delivered (66 in total) then the Class 345’s will operate between London Paddington and Heathrow Airport and hopefully Reading and between Whitechapel and Abbey Wood when the central section is opened in 2019 and Class 345’s will soon pass through Central London with Liverpool Street, Farringdon, Tottenham Court Road, Bond Street and Paddington which will be serving Central London and interchange with London Underground and National Rail services.